You might have noticed that we've been featuring Filipino recipes using organ meats as the main ingredients for the previous days, mostly were from oxen and cows. That's because organ meat dishes are our focus this week. 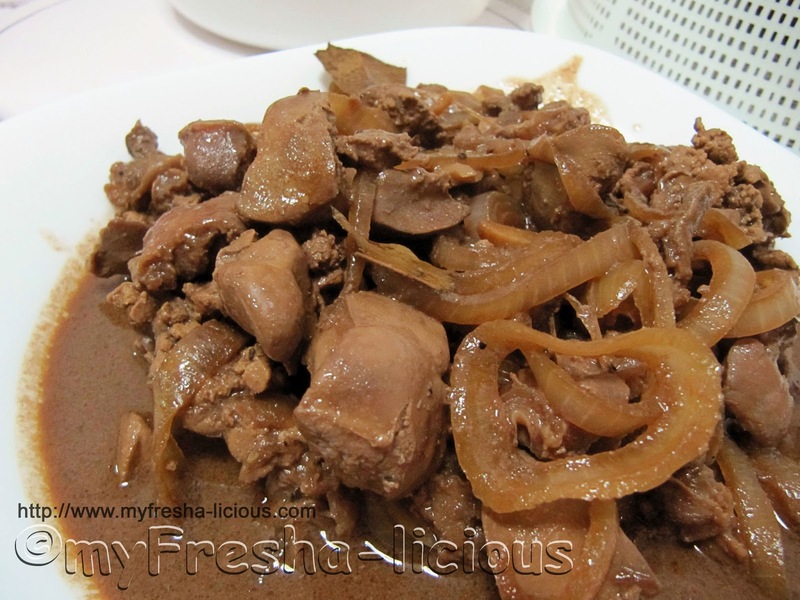 This adobo recipe uses meat organs as main ingredients, and this time from chicken. There's not much to say about this dish other than "try it, it is delicious". Like all organ meat, chicken gizzard and liver are considered exotic food for some and is an acquired taste for one to appreciate it. But, like any other Filipino, I can vouch for the yummy-nes of this dish. Here is a list of all Organ Meat Dishes posted in our blog. Just in case you're interested. 2. Place the oil and the garlic in a frying pan and saute them until aromatic. Add in the onions and stir. 4. Throw in the rest of the ingredients except for the liver and the cane vinegar. Sprinkle with additional mixed peppers and bring to a boil. Simmer for about 30 minutes or until the gizzards are tender. Add the vinegar and more water as needed. Continue cooking until a small amount of liquid remained. 6. Toss in the onion rings and give a quick stir (do not let it wilt). Remove from fire.